So, next time chewwy comes around I’m gonna go for him. However I’ve read about it and heard that bossk is a must. But i have 4 7* BH already and currently farming jango (will use him for the event as he is very good) and also annoyingly bossk (he is good but don’t have him as geared as I need) the dilema is. Who is best to use given my current options? The photo shows my current power of all my bounty hunters. You're gonna get smushed. Need lots more gear. Get Bossk, use Bossk Boba Greedo Cad. Fifth is whoever you have developed ... might as well work on Dengar at this point, but if he isn't available for the event then go with Jango. IG-88 will be little more than a greasy smear at g7. You need either Bossk or Dengar, preferably both, or else you're going to have a really tough time. If I were you I'd aim for a lineup of zBossk (L), Boba, Dengar, Cad Bane, and Jango or Greedo. You said you're already working on Bossk so just continue with that, and then farm Dengar from the guild store. Dengar doesn't need high level gear for this event, so it's not much of a problem to gear him. I'd go for Jango over Greedo since he is a better character, but you already have Greedo at 7*so it's up to you. Thank you for the help 😁 another quick question, what mods are best for this event? Mod Boba with crit dmg set, crit dmg on triangle and max. offense primaries/secondaries on the rest (alternatively crit chance secondaries). You want Boba to do max dmg on a crit with his execute. If using Bossk lead mod him for high tenacity (primaries and sets). If he manages to resist stuns etc. in the initial wave, you will be far better off. If using Boba lead mod the rest of your team with high potency to take advantage of the health bonus from his leadership. 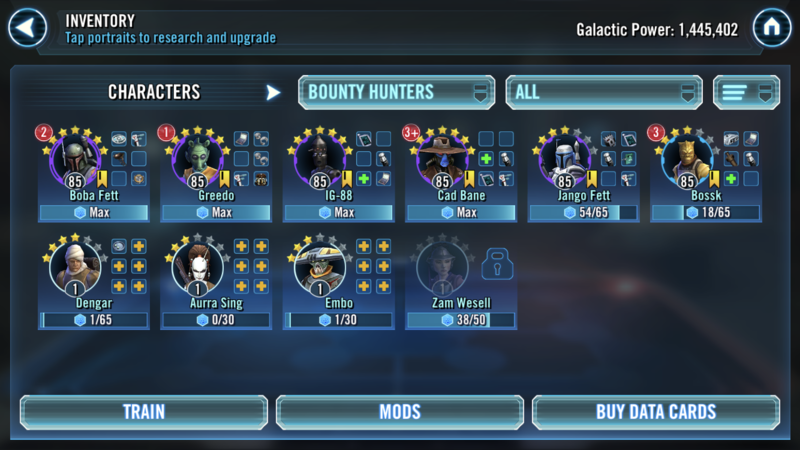 If using Greedo mod him for high crit chance as well to increase the chance for bonus hits with his basic. If using Cad Bane mod him for some potency to increase the chance of landing stuns. If using IG-88 don't use its AoE. That would be pure suicide. It feeds high bonus TM to the enemy as long as Leia is present. I was actually going to do Cad lead but I have been working up Bossk anyway for the ship.... I haven't done the event at all yet on this account. I can say though that Bossk has a pretty fast path to fulfilling the contracts, 10 hits on weakest toon. Cad's is slow, 30 debuffs. Boba's is pretty fast too, 10 hits on someone (with basic?). Is bossk zeta on his lead nessassay? I have a zeta ready to apply. I don’t use bounty hunters though. So don’t really wanna use it on them. But if it means 7* chewy then I’ll have to. And also if I do need to zeta bossk lead. 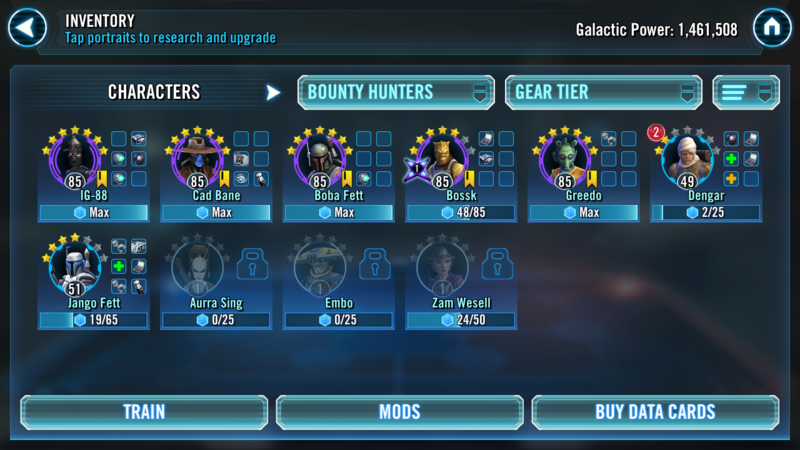 Is that the only zeta required? It's a phenomenal Zeta. And gearing Bossk is a joke.